Dramatic designer Indian jewellery set in antique gold (bright gold colour with black antique) & maroon red; bejewelled with pearl & gleaming kundan stones. This Ruby Maroon Sabyasachi Inspired Bridal Jewellery Set emulates the jewellery designs by this style icon. The lavish choker seamlessly flows onto the chest for a truly regal look. 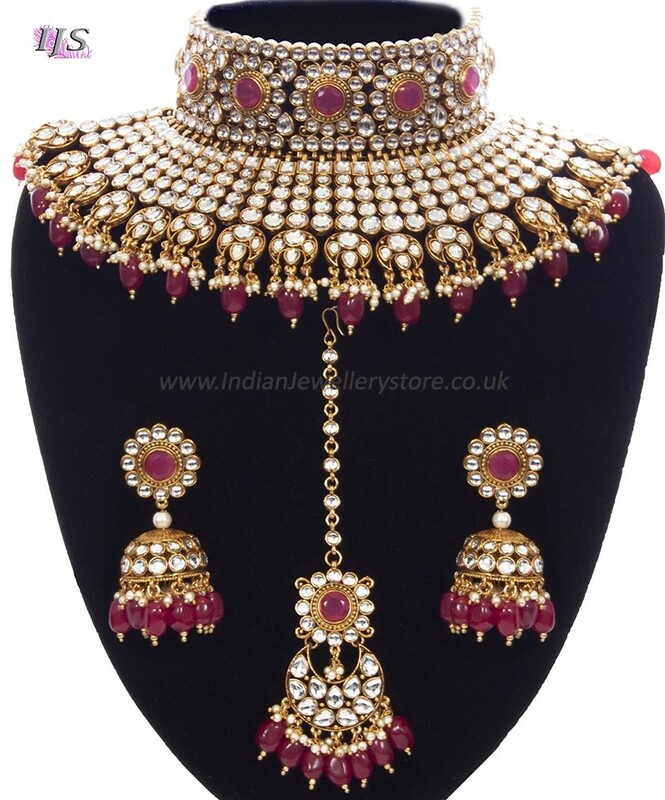 This kundan in this piece is truly stunning and at an amazingly low price for the quality, this set is a total must have for fashionistas and this season's Asian brides! Dimensions are as follows (at widest points): Statement designer necklace - 4.0cm wide falls a further 6.5cm. Jhumki Indian earrings - stud 2.5cm wide, jhumki 3.5cm wide, overall earring length - 7.5cm.